Last year, astronomers discovered a terrestrial exoplanet orbiting GJ 1132, a red dwarf star located just 12 parsecs (39 light years) away from Earth. Though too close to its parent star to be anything other than extremely hot, astronomers were intrigued to note that it appeared to still be cool enough to have an atmosphere. This was quite exciting, as it represented numerous opportunities for research. In essence, the planet appeared to be “Venus-like” – i.e. very hot, but still in possession of an atmosphere. What’s more, it was close enough to our Solar System that its atmosphere could be studied in detail. However, a debate began over whether its atmosphere would be hot and wet, or thin and tenuous. And after a year of study, a team of astronomers from the CfA believe they have unlocked that mystery. In addition to being relatively close to our own Solar System in astronomical terms, the Venus-like exoplanet GJ 1132b also has a relatively small orbital period around its star. This means that opportunities to spot it as it passes in front of its star (i.e. the Transit Method), occur quite often. This makes it an excellent target for detailed observation and study, which in turn will help astronomers to learn more about terrestrial exoplanets that orbit close to red dwarf stars. But as noted already, astronomers were divided on the issue of GJ 1132b’s atmosphere. Thanks to the research efforts of Laura Schaefer and her colleagues from the Harvard-Smithsonian Center for Astrophysics (CfA), it now appears that the case for a thin atmosphere is the far more likely. Interestingly enough, this was confirmed by determining just how much oxygen the planet has in its atmosphere. For the sake of their study, which was outlined in a paper that approved for publication in The Astrophysical Journal – titled “Predictions of the atmospheric composition of GJ 1132b” – they explain how they used a “magma ocean-atmosphere” model to determine what would happen to GJ 1132b over time if it began with a water-rich atmosphere. They began with the knowledge that a planet like GJ 1132b – which orbits its star at a distance of 2.25 million km (1.4 million mi) – would be subjected to intense amounts of ultraviolet light. This would result in any water vapor in the atmosphere being broken down into hydrogen and oxygen (a process known as photolysis), with the hydrogen escaping into space and the oxygen being retained. 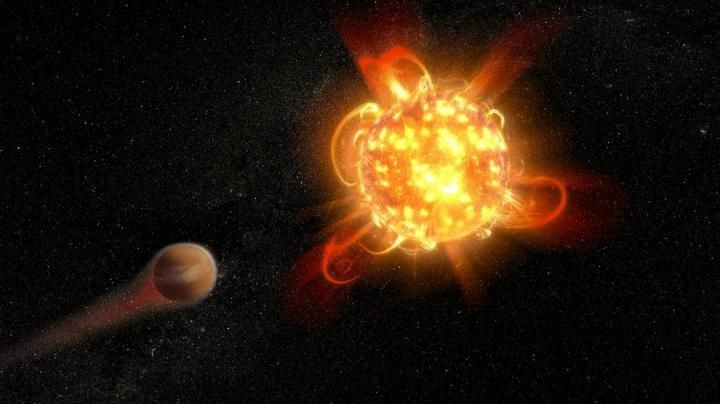 At the same time, they determined that the planet’s atmosphere and proximity to its star would lead to a severe greenhouse effect that would leave the surface molten for a long time. This “magma ocean” would likely interact with the atmosphere by absorbing some of the oxygen. How much would be absorbed and how much would be retained was the big question. They concluded that the planet’s magma ocean would absorb about one-tenth of the oxygen in the atmosphere. The majority of the remaining 90 percent, according to their model, would be lost to space while a small margin would linger around the planet. This proved to be very much consistent with measurements made of the planet thus far. This magma ocean-atmosphere model could not only help scientists to study terrestrial exoplanets that orbit close to their parent stars, but also to understand how our own planet Venus came to be. For some time, scientists have theorized that Venus began with significant amounts of water on its surface, but that it then underwent a significant change. This ocean is believed to have evaporated due to Venus’ closer proximity to the Sun, with the ensuing water vapor triggering a runaway greenhouse effect. Over time, ultraviolet radiation from the Sun broke apart the water molecules, resulting in the hot, virtually waterless atmosphere we see today. However, what happened to all the oxygen has remained a mystery. Headquartered in Cambridge, Mass., the Harvard-Smithsonian Center for Astrophysics (CfA) is a joint collaboration between the Smithsonian Astrophysical Observatory and the Harvard College Observatory. It’s scientists are dedicated to studying the origin, evolution and future of the universe.